Train Smart with Firstbeat. Do you want to get the most out of your training? 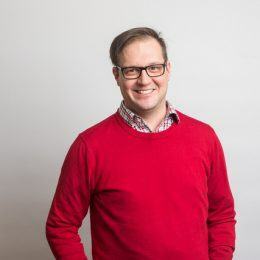 In this blog series we help you to understand the physiological background of Firstbeat features and how to use them to improve your fitness and achieve your performance goals. Have you run out of steam just before the finish line? Or have you lost a match because you couldn’t reach the ball? Anaerobic capacity is essential in most of the sports. Be it ball games, martial arts or athletics you need to be able to produce power fast and efficiently. Anaerobic metabolism shouldn’t be underestimated in endurance sports either. It is the key factor if you want to sprint for the finish line or drop your opponents behind. With anaerobic training you can improve your speed and strength as well as your VO2max and Lactate Threshold. It is also an effective way to increase your muscle mass and burn calories. Simply put, anaerobic exercise is a powerful way to improve your fitness and performance. Where aerobic stands for “with oxygen”, anaerobic means “without oxygen”. Thus, anaerobic metabolism creates energy when oxygen-based energy production is insufficient to meet the demands of the high-intensity activities. 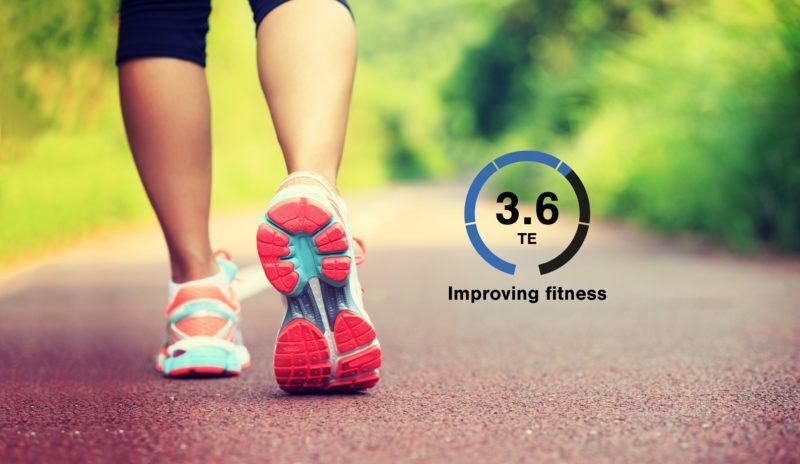 This means that the intensity is higher than your capacity to produce energy aerobically, that is your VO2max. The intensity of anaerobic effort can be, for example, 105 % or even 150 % of your VO2max – which means you really need to push hard and squeeze every last drop. There are two ways of producing energy anaerobically: lactic acid system and ATP-CP system. The lactic acid system produces energy through the combustion of carbohydrates and, as a by-product, is produced lactic acid. With moderate intensity exercise, lactic acid is removed but at higher intensities it starts to build up in your muscles. The point when lactic acid starts to accumulate is called the Lactate Threshold or the anaerobic threshold. This accumulation causes muscular fatigue in a brief period of time, which is why anaerobic exercise can’t last very long. The lactic acid system fuels your body only for two minutes or less. However, the lactic acid system is not the fastest anaerobic energy system. In efforts lasting fewer than 10 seconds, your body uses an anaerobic system called ATP-CP (Adenosine Triphosphate-Creatine Phosphate) system. This provides immediate energy through the breakdown of two high-energy phosphates that are stored in your muscles. Although lactic acid is not formed, these limited stores run out very fast after which body must rely on other energy systems. Find out more about the physiology of anaerobic metabolism in our White Paper. Anaerobic capacity is a many-sided phenomenon. 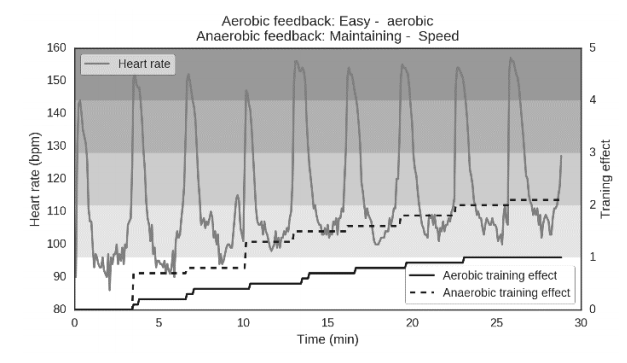 Thus, Firstbeat Anaerobic Training Effect gives an insight into not just your overall anaerobic fitness but also your anaerobic base and economy, power and speed – and how to improve these, especially with sprint and interval training. In this case, speed is considered as the tip of the ice berg. 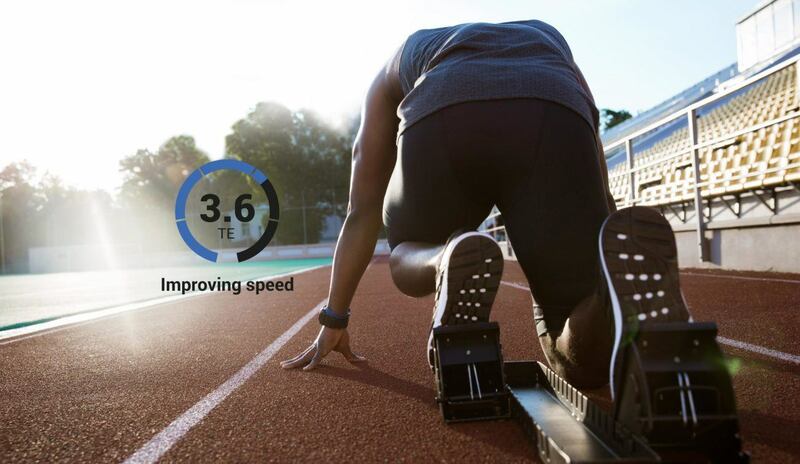 It gives insight into your most rapid efforts that last fewer than 10 seconds and use mainly the ATP-CP energy system. It describes your ability to produce power very quickly, which is essential for example in short sprints and jumps. To maintain or improve your speed, you should do intervals that are very intense (>140 % of your VO2max) but can’t last long. Anaerobic power, in turn, refers to the effectiveness of your lactic acid system. It tells how well your body is able to break down glucose to generate energy anaerobically. Anaerobic power can be trained by intense intervals (>115 % of VO2max). Less intense (>95% of VO2max) intervals are a good way to improve your anaerobic base and economy. 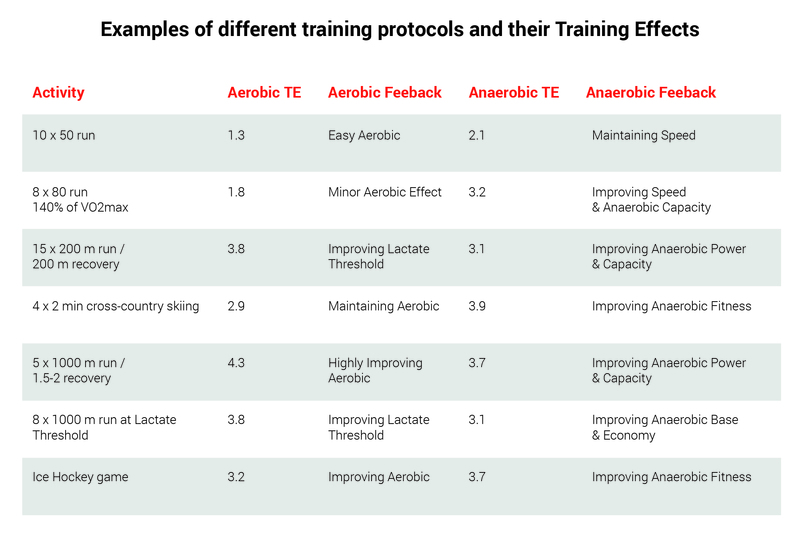 Both Aerobic and Anaerobic Training Effect values range from 0.0 to 5.0, where 0.0-1.0 stands for no effect, 1.0-2.0 means minor effect, 2.0-3.0 is maintaining, 3.0-4.0 is improving, 4.0-5.0 is highly improving and 5.0 means that you are overreaching. Note that the above Training Effect values and phrases are examples. Your experience may differ depending on your personal fitness, training history and habits. The more repeatitions you do, the more interval training affects your overall anaerobic capacity and tolerance of fatigue. It improves your muscles ability to work anaerobically, beyond your VO2max. But what if interval training is not your cup of tea? Can you still improve your anaerobic capacity? Yes, you can. 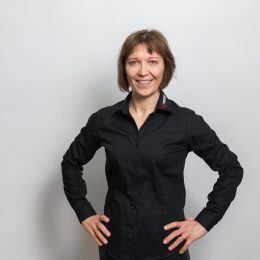 As long as you do short and intense efforts, be it during ice hockey game or a spinning class, your body is producing energy anaerobically when the aerobic system is maxed out. You may not improve your maximum speed or anaerobic power specifically, but your overall anaerobic fitness will improve, as long as you training intensity is high enough. Interval training that include 9 x 50 m sprint running produced Anaerobic Training Effect of 2.1 (maintaining speed) and Aerobic Training Effect of 1.0 (easy aerobic). Ice hockey game that included three periods and measurement breaks between produced Anaerobic Training Effect of 3.7 (improving anaerobic fitness) and Aerobic Training Effect of 3.2 (improving lactate threshold). After all, it is good to keep in mind, that all energy systems (aerobic, lactic and ATP-CP) overlap and complement each other but the extent of each system depends on the effort. Where the ATP-CP system is most valuable for a weight lifter, a 400 m runner needs an excellent anaerobic capacity and a cyclist counts mostly on aerobic system – but utilizes those two anaerobic systems too. 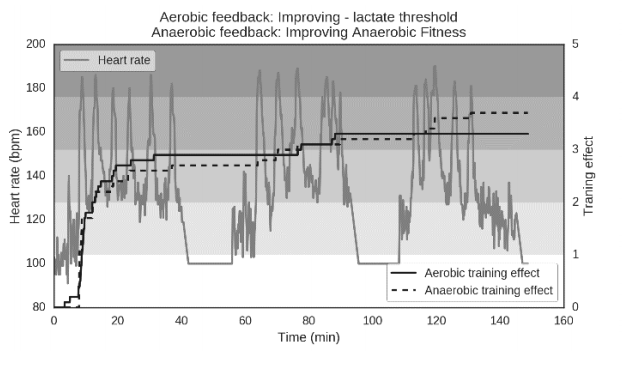 Thus, combining the feedback from Firstbeat Anaerobic and Aerobic Training Effect gives you a deeper insight into the impacts of different types of training. In fact, for endurance athlete, anaerobic capacity can make the difference between winning and losing. Researchers at Georgia State University found that individual differences in anaerobic capacity explained even 31 percent of the differences in 5K running times. You can read more about how endurance athletes benefit from anaerobic training in our previous blog. HIIT as a way to spice up your fitness routine?